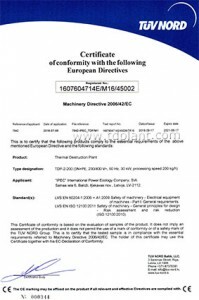 IPEC obtained the international certificate of compliance with the requirements of the Directive 2006/42/EC on machinery for pyrolysis plants TDP-2-200 and TDP-2-800. The document confirms that all the products of IPEC make are designed and manufactured in accordance with the requirements of the Directive and meet the standards of EN 60204-1:2006+А1:2009 (Electrical equipment of vehicles and machinery) and EN ISO 12100:2011 (Engineering philosophy). Due to the certificate and the Declaration of Conformity with Directive 2006/42/EC IPEC is enable to export products to the domestic market in all countries of the European Union and European Economic Area.